Considered by several of his peers to be one of the most influential modernists of the 19th century, Cezanne developed during his mature years a highly innovative type of modern art, which might be called 'abbreviated Impressionism'. Although influenced by the optical reality of Monet's pure Impressionism (if the sea looks pink, paint it pink), Cezanne focused on form and structure rather than ornamentation. Thus, for instance, he simplified natural shapes into varieties of geometric motifs (cones, spheres, rectangles, and the like), and relied on flat areas of strong colour to achieve depth and harmony. (Compare this with the characteristics of Impressionism.) As exemplified by this particular landscape painting, his carefully controlled use of vertical and horizontal lines, together with a marked design-oriented approach to the picture plane, looks backwards to the Italian Renaissance, as well as forwards to the Cubism of Picasso (1881-1973). NOTE: For the full story behind Impressionism and the group of young painters who started it, please see our 10-part series, beginning with: Impressionism: Origins, Influences. According to a tradition going back to Chocquet this picture was thought to have been painted at Mennecy near Corbeil (Seine et Oise), where Cezanne stayed in 1897. 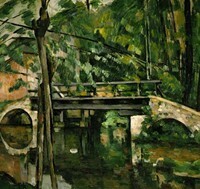 However, the actual bridge was discovered not long ago - still intact - at Maincy, a village near the town of Melun (Seine et Marne), where it is known from his correspondence that Cezanne stayed between June 3, 1879, and February 25, 1880, and later on in 1894. The date 1879 (for the picture was obviously painted in the summer) is quite consistent with the compact brush-strokes which still recall the Auvers period. Very soon Cezanne's style was to loosen up, becoming around about 1890 like that of a watercolourist. The Bridge at Maincy is transparent, lively, set like a stained-glass window. The shade and the freshness are almost tangible. The stillness is absolute. No breeze disturbs the sleeping stream. The difference in outlook from (say) Claude Monet is plain to see in much of Cezanne's work; in this case it is flagrant. Cezanne's earlier feathered Impressionistic brushstrokes have been replaced with the constructive marks he developed for the rest of his life. In order to give a stronger impression of form to this landscape of trees, leaves and water, Cezanne has pushed the sky out of the picture, thus banning every cloud from the air and all reflection of it from the water. He gives to the splendour of the spring foliage the effect of precious stones. The little parallel blobs of paint resemble the facets of cut emeralds. Indeed, very few of Cezanne's paintings are so intensely coloured. Conforming to custom, the artist has firmly marked in the vertical (the tress on the left) and the horizontal (bridge parapet) lines of the composition. Also, note how the eye is drawn into the deepest recesses of the picture by the use of dark browns and greens. This is one of the definitive works of Cezanne's maturity - a prelude to his series of Mont Sainte-Victoire Paintings (1882-1906), and it links him with the great artists of the Renaissance. NOTE: For other masterpieces of plein-air landscape painting by Cezanne, see: The House of the Hanged Man (1873) and the series of Mont Sainte-Victoire paintings (1882-1906). The Bridge at Maincy was sold by Cezanne to the popular art supplier and dealer 'Pere' Tanguy (1825-94), who sold it on to the amateur collector Victor Chocquet (1821-91) for 170 francs. At the Chocquet sale in 1899, now entitled the Little Bridge, it was bought by Monsieur Edmond Molyneux for 2,000 francs. In 1955, the Louvre Museum bought acquired it from the Molyneux Collection for 30 million francs, confirming his status as one of the best landscape artists of his era.  Canal St Martin (1870) by Alfred Sisley.  Misty Morning (1874) by Alfred Sisley.  Snow at Louveciennes (1878) by Alfred Sisley.